Ewha Womans University has elected its new president through its first-ever direct vote of all students, faculty members and administrative staff, ending months of allegations and internal turmoil that were tied to the scandal involving former President Park Geun-hye. Philosophy professor Kim Hei-sook was formally appointed Friday by the board of directors as the new president, the Seoul-based school said. She received 57.3 percent of the votes in the final round of the election held Thursday, it added. Kim, 62, will assume the top post left vacant for seven months after Choi Kyung-hee stepped down amid fierce protests from Ewha students. The former chief is now on trial for her alleged role in giving special treatment to Chung Yoo-ra, the daughter of former President Park’s longtime friend Choi Soon-sil. It was the first time that the school picked its leader through a direct election participated by all its members, since its foundation in 1886. Over 1,000 alumni also cast their ballots. 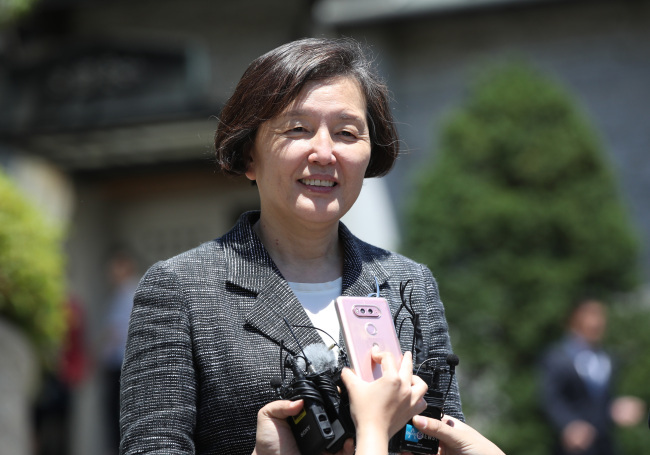 “I will return Ewha to its original state and restore its honor,” said Kim whose term as the school’s president will begin on May 31 and end on Feb. 28, 2021. Ewha, South Korea’s longest-running university, suffered from a bitter confrontation between the school leadership and students over a number of issues in the past year. But the heaviest blow came from the scandal involving the former president. Chung, a former national dressage player, was illegally admitted to the school and was given special treatment in grades, investigations by the Education Ministry and state prosecutors have found. Amid the turmoil, Kim was at the forefront of organizing professors to hold a rally against the school’s previous leadership led by Choi Kyung-hee, which was the first of its kind in the school’s 130-year history. The university’s former president and other professors are now standing trial on suspicions. President Park was impeached for corruption and abuse of power in early March and is also being tried in the same court with her confidante Choi Soon-sil. Chung, Choi Soon-sil’s daughter, is likely to be extradited from Denmark where she was arrested for illegal stay and face investigation here. Kim has been teaching at Ewha University since 1987. She received an undergraduate degree in English Literature from the university and a Ph.D. degree in philosophy from the University of Chicago.